The Canadiens evened the game midway through the third period, but Tyler Johnson scored the tie-breaking goal with 1.1 seconds remaining in regulation to lift the Lightning to a 3-0 series lead. The Montreal Canadiens evened the game midway through the third period, but Tyler Johnson scored the tie-breaking goal with 1.1 seconds remaining in regulation to lift the Tampa Bay Lightning to a 3-0 series lead. * Johnson's goal was the second game-winning goal in the final two seconds of regulation in the Second Round of the 2015 Stanley Cup Playoffs (also: Washington Capitals forward Joel Ward in Game 1 at the New York Rangers: 19:58). Per Elias, there were only two such goals scored in NHL postseason history prior to this year: Toronto Maple Leafs forward Bob Pulford on April 11, 1964, vs. the Detroit Red Wings (19:58) and Carolina Hurricanes forward Jussi Jokinen on April 21, 2009, vs. the New Jersey Devils (19:59). * Elias also says it was the first time in Lightning history that the club scored a game-winning goal in the final 10 seconds of regulation in the postseason. They last accomplished that feat in the regular season on Feb. 25, 1998 at Washington (Alexander Selivanov, 19:52 of third period). * Johnson, who also scored the game-winning goals in Games 4 and 6 in the first round vs. Detroit, had up his third career decisive goal in the playoffs (14 GP). He has 10 game-winners in 173 regular-season games. * Johnson leads all players in this year's playoffs with eight goals and is tied for third with 11 points. That includes 2-2—4 in three games vs. Montreal. * Alex Killorn opened the scoring 12 minutes into the first period, his third goal of the postseason. Killorn, who had two assists in Game 2, has 4-5—9 in 14 career playoff games, including 3-4—7 this year (10 GP). * Ben Bishop made 30 saves, including 14 in the third period, to earn his fifth straight win dating to Game 6 of the First Round vs. Detroit. He has a 1.12 goals-against average, .962 save percentage and one shutout in that span. * The Lightning, who were swept by the Canadiens in the Eastern Conference First Round of the 2014 playoffs, improved to 8-0-0 this season vs. Montreal (regular season and playoffs). Bishop has been in goal for each of those eight games and has a career record of 13-1-2 in 17 games vs. Montreal (regular season and playoffs). * All three playoff series between the Lightning and Canadiens have featured one team winning Games 1-3. The first two ended in sweeps – 2004 ESF (won by Tampa Bay) and 2014 Eastern Conference First Round (won by Montreal). * The Lightning improved to 3-2 at Amalie Arena this postseason, after leading the League and setting a franchise record with 32 home wins during the regular season. * The Lightning are one win shy of advancing to the Eastern Conference Final for the first time since 2011 vs. the Boston Bruins. Their only other trip to the conference final was in 2004 en route to the franchise's only Stanley Cup. * ICYMI: Click here to watch Lightning fans react to the club's Game 3 using #MyPlayoffsMoment. 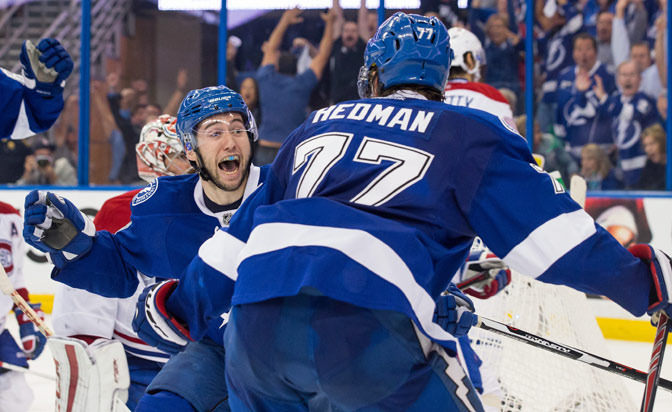 Lightning forward Tyler Johnson scored the game-winning goal at 19:58 of the third period in Game 3 vs. Montreal. It was the fourth winning goal scored in the final minute of regulation during the 2015 Stanley Cup Playoffs (60 GP). Ward also accomplished the feat in the second round (at 19:58 of the third period in Game 1 at the Rangers). The others came in the first round by Calgary Flames defenseman Kris Russell (at 19:30 of the third period in Game 1 at the Vancouver Canucks) and Ducks forward Jakob Silfverberg (at 19:39 of the third period in Game 2 vs. the Winnipeg Jets). * In 2014, Canadiens forward Max Pacioretty scored the series-clinching goal at 19:17 of the third period in Game 4 of the first round vs. Tampa Bay. * In 2013, St. Louis Blues defenseman Barret Jackman scored at 19:09 of the third period in Game 2 of the WQF vs. the Los Angeles Kings and Chicago Blackhawks forward Dave Bolland scored the Stanley Cup-winning goal at 19:01 of the third period in Game 6 of the Final at Boston. * In 2011, Canucks forward Raffi Torres scored at 19:41 of the third period in Game 1 of the Final vs. Boston. 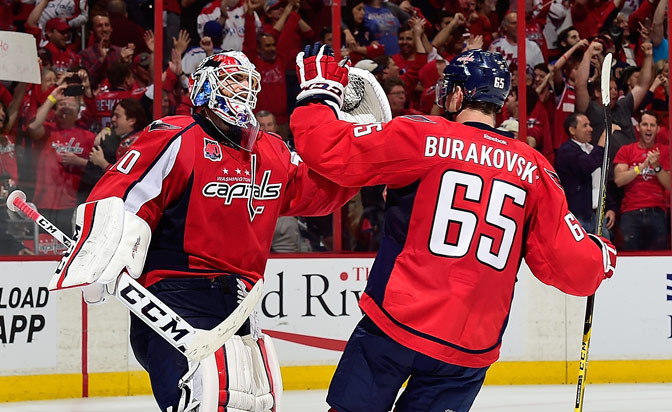 Braden Holtby made 28 saves and Andre Burakovsky scored twice – including the game-winning goal 24 seconds into the third period – to power the Washington Capitals to a 3-1 lead in their series with the Rangers. * Holtby made 13 stops in the opening period and denied a Carl Hagelin penalty shot at 8:01 of the third period to improve to 6-4 with a 1.48 goals-against average, .950 save percentage and one shutout in this year's playoffs (10 GP). * The Capitals faced a penalty shot in the postseason for the third time in franchise history. The others: April 9, 1983 vs. the New York Islanders (Al Jensen SV vs. Denis Potvin) and April 15, 2008 at the Philadelphia Flyers (Cristobal Huet vs. Mike Richards). Holtby has denied three of five career penalty shots (regular season and playoffs). * Holtby has allowed no more than one goal in 13 of his 16 career playoff wins, including each of his last 10 dating to Game 6 of the 2012 Eastern Conference Semifinals vs. the Rangers. * Via Elias, Holtby is the first goaltender to surrender one goal or fewer in 10 consecutive playoff wins since Boston's Tuukka Rask from May 21, 2013 to April 22, 2014 (10 wins). * Holtby also improved to 9-9 in 18 career postseason games vs. the Rangers. That includes a 7-2 record with a 1.27 goals-against average, .952 save percentage and two shutouts in nine games at Verizon Center. * Burakovsky, who entered Game 4 with one assist in his first seven playoff appearances, became the fourth rookie in Capitals history to score his first two career postseason goals in the same game. He is the second to accomplish the feat this year after Evgeny Kuznetsov in Game 5 of Washington's First Round series (April 23, 2015 vs. the Islanders). The others: Sergei Gonchar (May 6, 1995 at the Pittsburgh Penguins) and Marcus Johansson (April 20, 2011 vs. the Rangers). * Burakovsky registered 9-13—22 in 53 games during his rookie season, including two game-winning goals. His only other multigoal game in the NHL was Feb. 15 at the Anaheim Ducks. * The Capitals are one win shy of advancing to the Eastern Conference Final for the third time in franchise history and the first time since 1998, when they went on to their only Stanley Cup Final. Their other trip to the conference was in 1990, when they lost to Boston. Bob Hartley of the Calgary Flames, Peter Laviolette of the Nashville Predators and Alain Vigneault of the Rangers are the three finalists for the 2014-15 Jack Adams Award, presented to the head coach who has "contributed the most to his team's success," the National Hockey League announced today. Click here for more information on each finalist. The Rangers played their 11th consecutive one-goal postseason game dating to Game 4 of the 2014 Stanley Cup Final, extending the longest such streak in NHL history (via Elias). . . . The Rangers allowed two goals or fewer for the seventh straight game, the first time they have done so in the playoffs since 1997. . . . Lightning captain Steven Stamkos had an assist in Game 3 vs. MTL. He has 1-3—4 in his last two games after going 0-3—3 in his first eight playoff games this year. . . Goaltender Henrik Lundqvist (28 saves) made his 100th consecutive playoff start, all with the Rangers. Elias says he is just the third goaltender in NHL history to make at least 100 straight playoff starts with one team, following Martin Brodeur (194 with New Jersey) and Patrick Roy (133 with the Colorado Avalanche). . . . Brendan Gallagher, who was celebrating his 23rd birthday, scored the lone goal for the Canadiens. He has 4-2—6 in seven career playoff games vs. Tampa Bay, compared to 3-2—5 in 12 career regular-season games against the Lightning. . . . Canadiens defenseman Tom Gilbert (0-1—1) had a point for the third straight game. He has 2-2—4 in his postseason career (14 GP), all in his last five games. . . . Rangers forward Derick Brassard scored his team-leading fifth goal of this year's playoffs (9 GP). He had eight goals in his first 35 career postseason games.